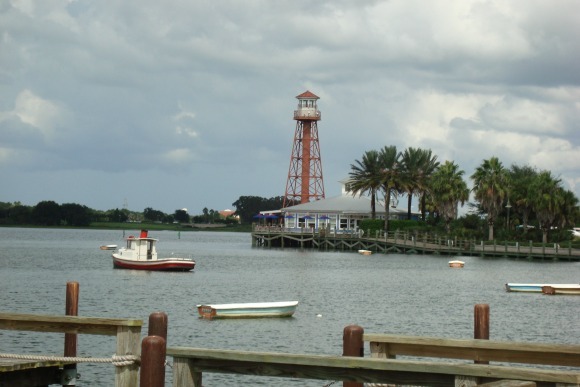 Is The Villages Really Florida's Friendliest Home Town? The Villages is a master planned retirement community that sprawls over Sumter, Lake and Marion counties along US-441/US-27 between Ocala and Leesburg, Florida. It is about 68 miles northwest of Orlando International Airport and about 90 miles northeast of Tampa International Airport. The Villages is bounded approximately on the east by US 27/US 441, on the west by US-301, on the north by County Road 42 and on the south by Sumter County Road 466A. Sumter County Road 466 serves as the main east-west corridor, with Buena Vista Boulevard and Morse Boulevard serving as major north-south corridors. Harold Schwartz, a Michigan businessman, began selling land tracts via mail order in the area in the 1960's. Not too long after, the laws were changed to prohibit selling real estate by mail. It started to develop in earnest in the 1980's when Schwartz brought in H. Gary Morse to run the operation. Morse had a gift for understanding what active retirees were looking for in a lifestyle, and he made sure The Villages had those factors. He was wildly successful, and The Villages Florida has altered forever the backroads travel pattern in this part of the state. Mr. Morse was active in the community until his death in October 2014. The Villages Florida now has about 77,681 people according to the 2010 census, and most experts predict the population will continue to increase until there are no more lots to sell or nearby land to develop. The population in the 2000 census was only 8,333, so it is obvious that people are attracted to the community in overwhelming numbers. Most of The Villages is an "adults only" community where homes must be occupied by at least one person who is 55 years of age or older. Persons under the age of 19 years are not permitted to reside within The Villages but may visit for a maximum of 30 days per year. There are three subdivisions in The Villages which are designated as family units and are not subject to this restriction. I know many people who live in The Villages, and all of them love the place. Most of them are active retirees who came down from up north, and most of them are very conservative both socially and politically. I personally don't know any native Floridians who live in The Villages, although I am sure there must be some. It's appearance has made it become the quintessential "Anywhere, USA". If you were to be brought there blindfolded and then allowed to see it, you'd think you were in any number of southern states. The only thing "Florida" about The Villages is the climate and the golf courses. The Villages comprises several communities, each clustered around one of 37 separate golf courses. 28 of these courses are 9 hole executive layouts, and 9 of them are country club 18 hole championship courses. One of the benefits of living there is that you can play golf "free" for the rest of your life on the 9 hole courses. Your golf membership is included in the general fees that a homeowner pays in local taxes to a Community Development District. Greens fees are charged on the 18 hole courses. Community Development Districts are not uncommon in Florida; there are more than 200 of them. They are quasi-governmental units that give the developer the right to finance his development with bonds and pass on the cost of infrastructure to the eventual residents of the district. Many - if not most - people who live in The Villages have a golf cart. CBS's "Sunday Morning" television show in May 2011 said there are 50,000 carts. Grocery stores, restaurants, health spas, and most other businesses can be reached by using a golf cart. 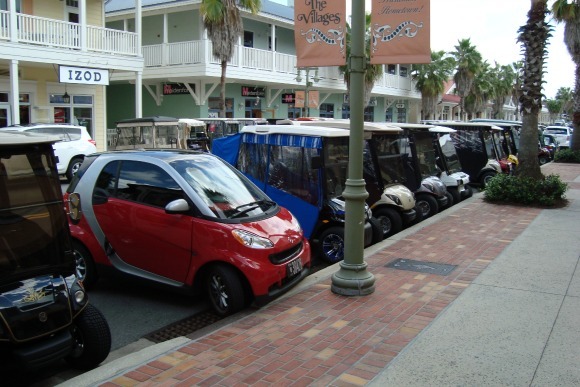 If you're a visitor, you can even rent a golf cart at several locations. There are two town squares in The Villages, each with a band shell and free concerts. These squares are the hubs of community evening activity. Thousands of golf carts line up while their occupants enjoy the music and fellowship and head home when it's done. Some of them are very cute, fixed up to look like miniature Rolls Royces, fire engines, boats or whatever strikes the owner's fancy. The Villages has hundreds of miles of golf cart paths; golf carts are the preferred means of transportation for many residents, even those who don't play golf. The Villages residents enjoy more than 1300 clubs that cover just about any hobby or interest a person could have. They also have sports teams and leagues and all kinds of other activities that are free to the residents. Florida backroads travel is fun if you start your trip from The Villages Florida. If you start elsewhere, you won't find many backroads in this booming community. I try to avoid The Villages when doing my Florida backroads travel in Central Florida. Too much traffic if you are just passing through. On the other hand, it's a great destination for fun even if you don't live there. Speaking of fun, there have been rumors that The Villages Florida has the highest rate of STD (sexually transmitted diseases)in the United States of America. My friends who live in the community tell me this rumor is nothing more than an urban myth. I have not researched this either in person or on line. Some of the local Floridians who lived in Sumter, Lake and Marion counties before The Villages was developed have a real love-hate relationship with the community. They love the jobs and money that it brings into their lives, but they feel slighted and discriminated against by the residents of The Villages. There are some Florida crackers who insist that most of the residents of The Villages would like the entire place to be a gated community to keep "outsiders" like them from coming in. For what it's worth, during my more than 50 years in Florida I have observed people who already live here resenting it when other people move in. It seems to be true whether they are Florida natives or recent transplants from the north. 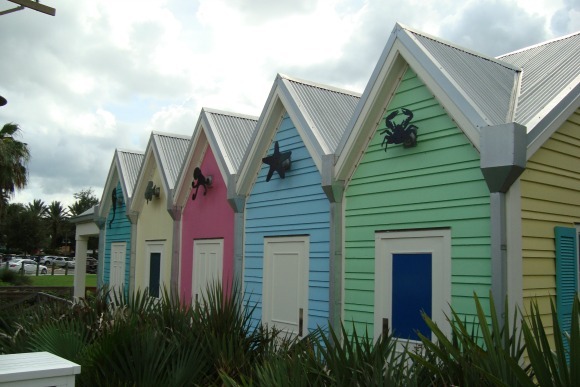 Many people want to slam the door shut after they've moved to Florida. There are several hotels and some bed and breakfast inns in The Villages and in the nearby Florida towns of Lady Lake, Leesburg, Ocala and Wildwood. A bit further away, but within an easy drive are Mount Dora, Gainesville and several other towns with plenty of lodging. This link takes you to one of our web pages that has dozens of suggestions for entertaining and relaxing day trips from your base at The Villages. 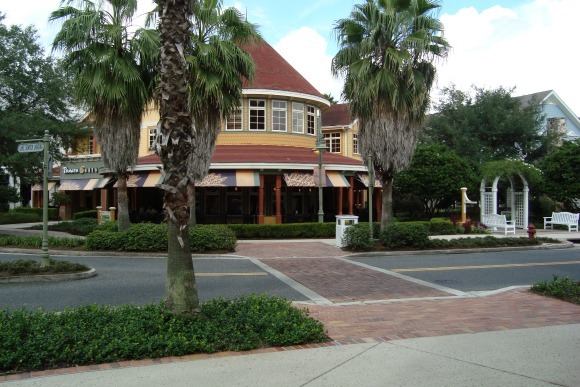 The Cotillion Southern Cafe is a favorite lunch and dinner spot for denizens of The Villages. 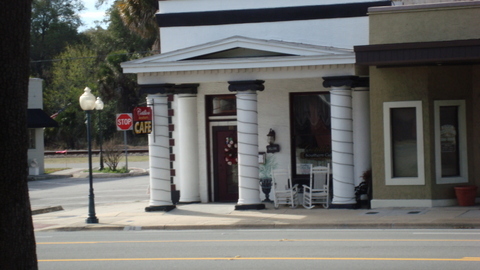 It is in the old restored Wildwood bank building on Main Street, also known as US Highway 301, across from City Hall. I recently had lunch at Cotillion and it was a wonderful experience. The dining room is decorated with antiques and old photos and posters that give it a homey comfortable feeling like your sweet old grandma's parlor. The room was packed with well dressed customers, mainly handsome mature women. The motto of the cafe is "Where Everything Is Served A.S.A.P. (As Southern As Possible). The servers were bright and friendly. I had a Cotillion House Salad, with grilled chicken strips as a topping. The salad had mixed greens, strawberries, Jack cheese, scallions, toasted pecans and the Cotillion house dressing. The salad was $10.99 with an extra $3.00 for the chicken. My glass of water was served in a mason jar. It was a great salad. The grilled chicken strips were the best I've ever had. Next time I go maybe I can find out what they were spiced with. They were delicious. Another surprise in the salad was a small chocolate mouse that I set aside and saved for dessert. The mouse is a long stemmed cherry dipped in chocolate with M&M's for its ears and the stem forming the tail. The menu focuses on Southern cuisine. There are a lot of things like smoked meat entrees, pork, low country shrimp and grits, and southern jumbo fried shrimp. Sandwiches include St. Augustine Crab Cakes, Junkyard Dawg (that's sausage on a grilled bun with bacon, grilled veggies and cheese), and the Florida Cracker Angus Burger. Dinner entrees are more elaborate, including Taste of the South Platter that is a half rack of slow smoked, dry rub, loin back ribs and pulled pork with homemade onion rings, baked beans, cole slaw and barbecue sauce. The menu is extensive, and also includes a lot of seafood selections. I intend to visit soon and have dinner. The owner, Miz Kathi, is in charge of all food preparation. Her desserts are made in house and include a wide selection of cakes and pies.